After jetting into the island on Monday, LA designer Meghan Fabulous was later joined by project runway alumni Jerell Scott and Gordana Gehlhausen for an exclusive trunk show at Kerrymanwoman home boutique on Wednesday. The designers showcased pieces from their newest collections, and shoppers came by to mix and mingle with the designers while shopping for some very unique fashion essentials. In preparation for the big day that was slated to be Thursday July 11, 2013, The Collection MoDA stayed true to its mandate to promote the business for fashion through various means by hosting the Business of Fashion seminar, held at JAMPRO, where various persons in the industry, both local and international, shared their knowledge and experiences with those who are working towards taking their brand or business to the next level. JAMPRO partnered with The Collection MoDA Fashion Series to focus on the manufacturing and distributing aspect of the fashion industry through the seminar under the theme ‘Start, manage and grow your fashion business’. 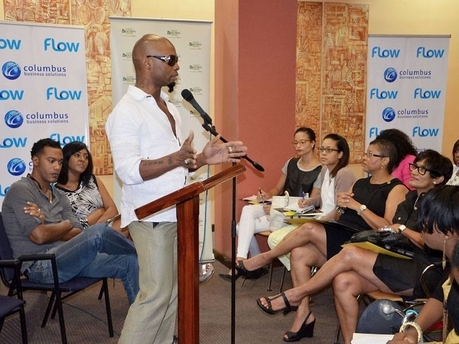 The seminar featured fashion industry experts as well as some of the Caribbean’s top designers. The seminar offered invaluable information on ‘How to Start a Business in Jamaica’, ‘How to Catch the Editor’s Eye in Fashion’, ‘How does Advertising Help Your Business?’, ‘Shopping Online and the Future of Fashion’, ‘From Concept to Product’, ‘Small Business Banking in Jamaica’, ‘Preparing for International Markets’ and more. The business of fashion is what truly matters, and persons willing to learn were educated by individuals within the industry such as Kimala Bennett, Walter Green (editor Profiles Magazine), Pat Wright, Courtney Washington and Kim-Marie Spence. A major part of the collection this year is the fashion grant that will be awarded to the designer with the most promise. First Global got involved in the initiative and will be awarding $100,000 to a lucky, budding fashion designer. According to FGB Marketing Manager Peter Lindo, “We are, as a bank, interested in supporting entrepreneurship and we were attracted to the title ‘The Business of Fashion’. Jamaica has a lot of potential in artistic endeavours and fashion is a part of that. We thought it was an opportunity to help a young entrepreneur at the beginning of their journey and hopefully be with him/her all the way,” he said. The response so far, he says, has been great. “It was slow at first and then we had a massive flurry of entries. The postponement of the fashion showcase has actually worked to the benefit because now more people have the opportunity to enter. The new deadline is now July 25, and the winner will be announced on the night of the showcase,” he ended. In cities throughout the world these magazines were greatly sought after and had a profound effect on public taste in clothing. A recent development within fashion print media is the rise of text-based and critical magazines which aim to prove that fashion is not superficial, by creating a dialogue between fashion academia and the industry.